KOLE CALHOUN gets a hug from Luis Valbuena in the Angels’s 8-5 win over the Blue Jays on Thursday. 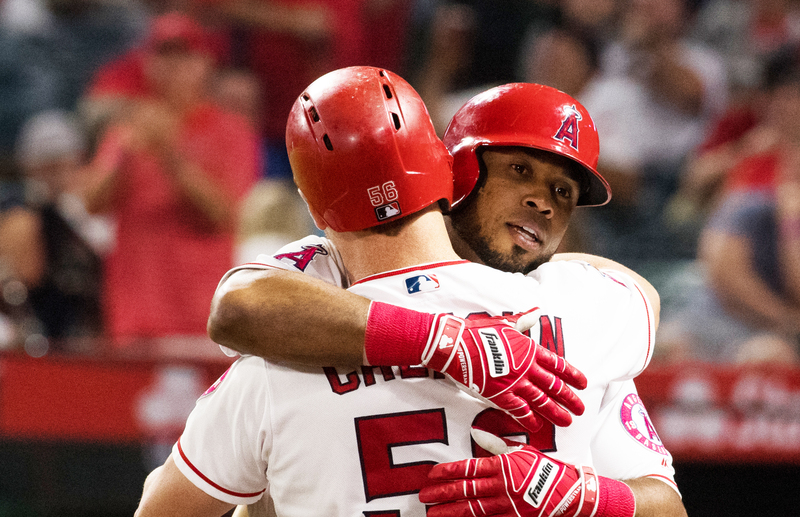 Valbuena had two homers and Calhoun one; they combined for five RBIs (Angels photo). Mike Trout, widely accepted as the best player in big league baseball, is so good he figures out a way to help his team win without even swinging the bat very well. On Thursday – his 1,00th career game – he walked three times and scored two runs in the Los Angeles Angels’ 8-5 victory over the Toronto Blue Jays at the Big A.
Trout, in the DH role because of a sprain in his index finger, continued to live on base. He’s reached 16 times in his last 17 plate appearances. He’s now batting .332 and leads MLB in home runs, walks, runs scored and Wins Above Replacement. While the star centerfielder did not provide much pop on Thursday, two other teammates took up that role. Luis Valbuena had a pair of home runs and Kole Calhoun one. Tyler Skaggs, who was expected to start, was scratched in favor of John Lamb, who struggled. He worked 3.1 innings, giving up six hits and three runs. Lamb walked one batter and struck out six. The bullpen was also wobbly, giving up five hits and two runs the rest of the way. The win went to Noe Ramirez (3-3), who worked 2.2 innings. He gave up no hits or runs and struck out four batters. On Friday, Andrew Heaney (3-4) will start for the Halos against Toronto.